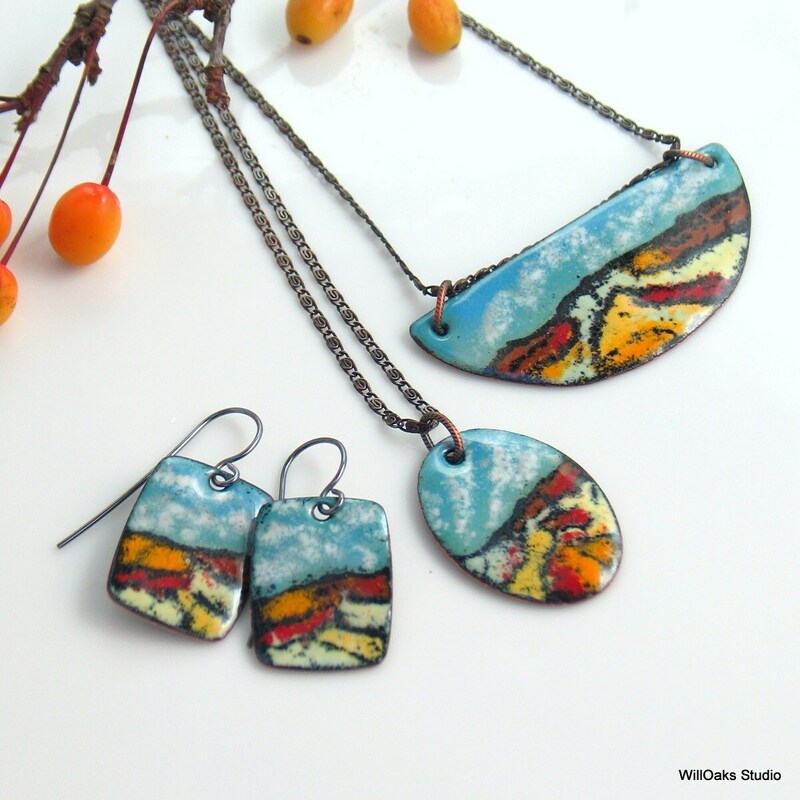 Pendant Chain Length No chain-earrings 16" 17" 18" 20" 22"
Bright, colorful jewelry collection is inspired by American Desert West landscapes. 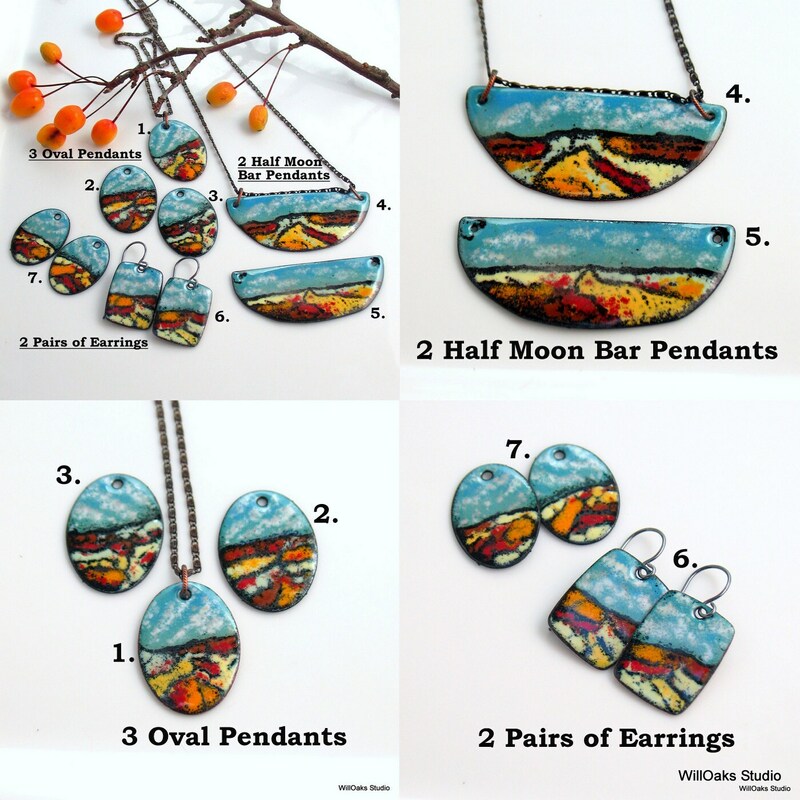 Copper enameled landscape art oval pendants, half moon shaped bar pendants, and pairs of earrings are each purchased separately as listed and priced. Ready to ship in my custom boxes, ready to gift. I'm happy to assemble jewelry SETS for your purchase-please contact me via Etsy convo with your preferences as I cannot list these as sets since each listing, from #1 to #7, is one of a kind. I will create a custom listing for you to check out with. 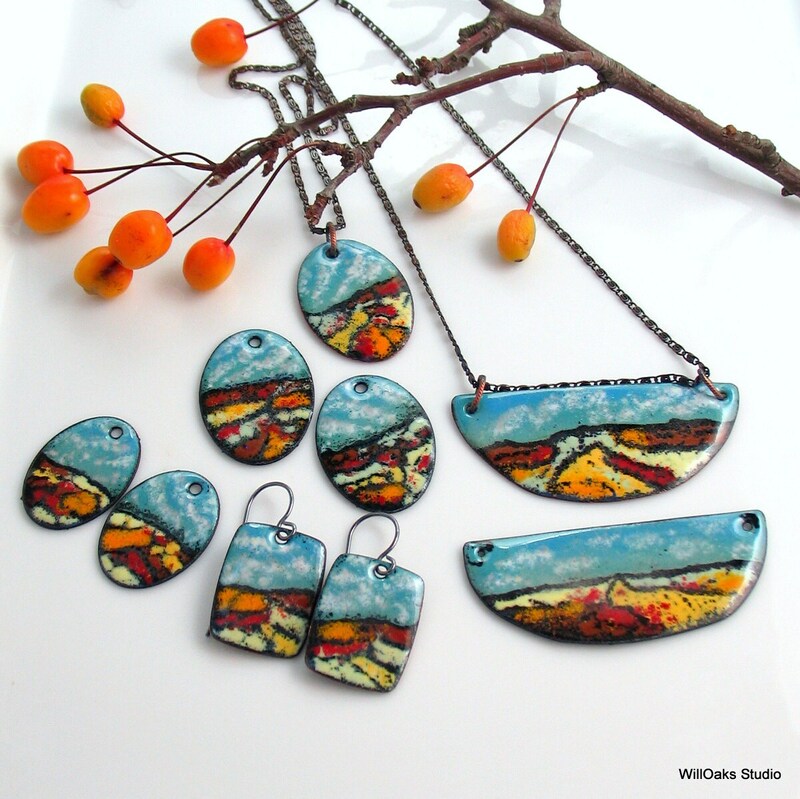 Perfect gift for nature lover, adventurer, traveler, and for people who appreciate original art jewelry. 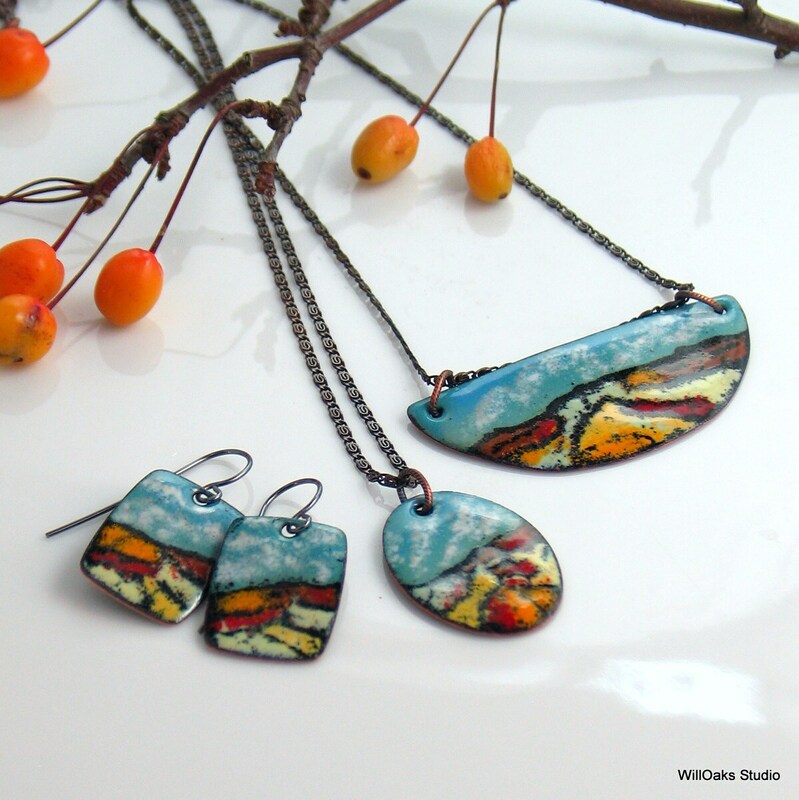 Add a pop of color and a beautiful detail to your day with these original pieces. Durable vitreous enamel is melted glass bonded to metal under very high heat, and is permanent. Pendants are sold with fancy textured copper jump rings and antiqued copper chains that create the finished chain lengths listed (I make them by hand to order.) Please select your finished pendant copper chain length from the "Variations List." Custom chain upgrades to dark oxidized sterling silver can be added to your order here https://www.etsy.com/listing/291396343/willoaks-studio-pendant-chains-made-to? If chosen, I will add the chain to your pendant before mailing. >Oval Pendants are just under 1" wide and 1 1/4" tall. 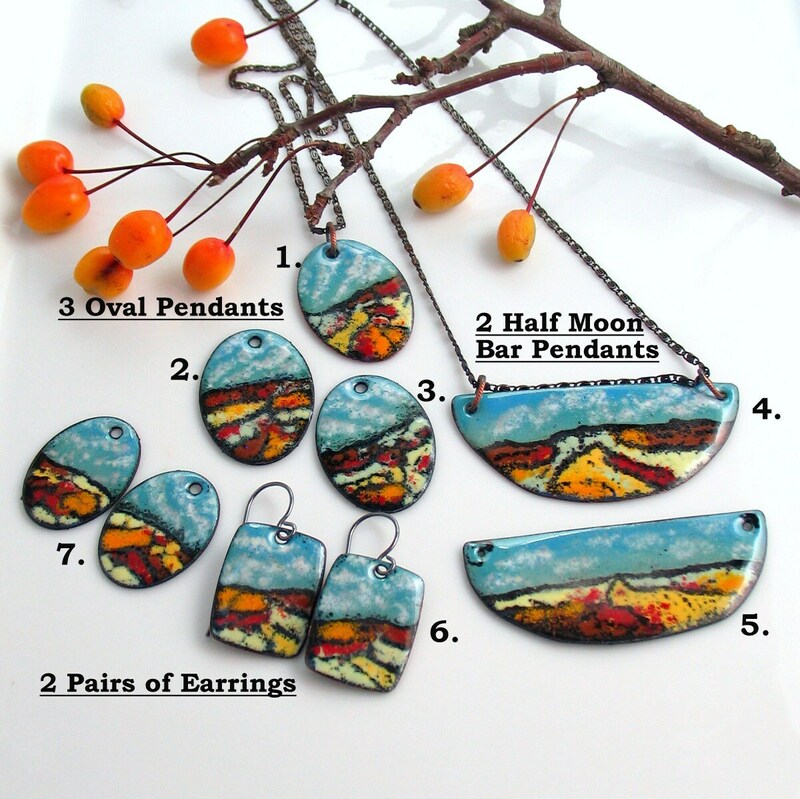 >Bar Pendants are about 2 1/4" wide and 1 1/4" tall-total length will include this 2 2/4" width. >Oval earrings are just over 3/4" wide and just over 1" tall and include oxidized sterling silver handmade ear wires. >Rectangular earrings are 3/4" wide and 1" tall and include oxidized sterling silver handmade ear wires. Please review prices and selections in my photographs. These correspond to the list of selections below. If an item number from my diagram is no longer active in this list, it has been sold. Please keep in mind that monitors and screens may show different colors from the objects themselves. I use a macro lens for close up details, please refer to scale in photos and sizes listed in the description. Please drop me a note if you have any questions! This pendant arrived quickly, and it is beautiful. I just love it! Karen is a wonderful artist and shop owner! She went above and beyond to help me get exactly what I wanted, great communication, speedy shipping, and tons of personalized attention. I highly recommend her shop and her work is absolutely beautiful!